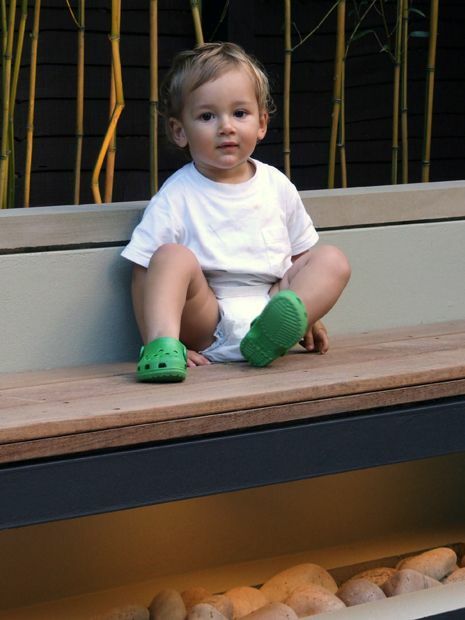 With an end-of-terrace house, 150 square metres of outdoor space and four young boys at various ages, we designed a contemporary family garden abundant in alfresco amenities which defined our top task. 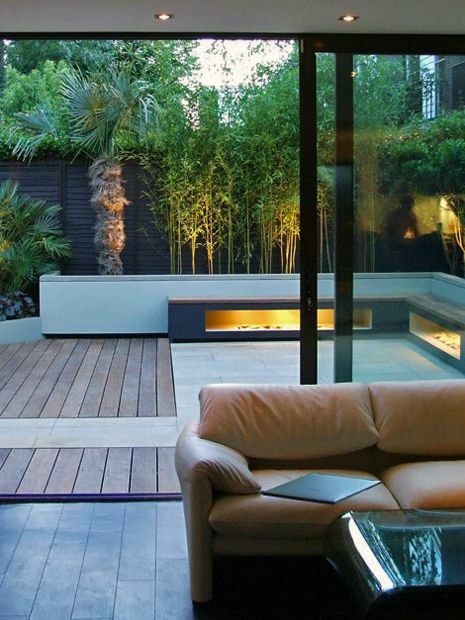 Based in Regent's Park, and travelling often to Southern France, our clients sought a minimalist solution for a unique exterior space. 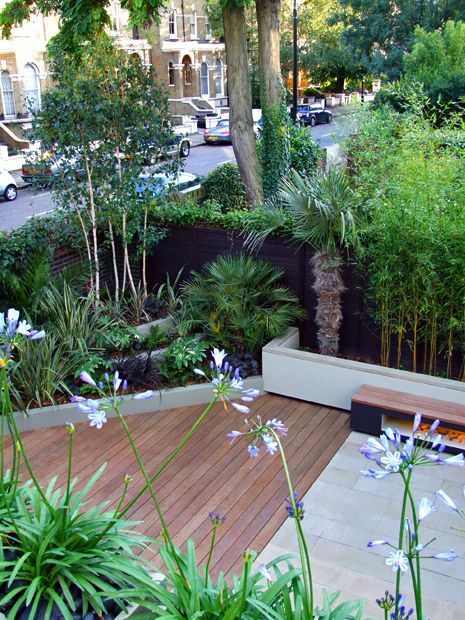 The extensive renovation of the family's home produced a new roof terrace above the living room, while three garden zones surrounding the property required complete transformation. 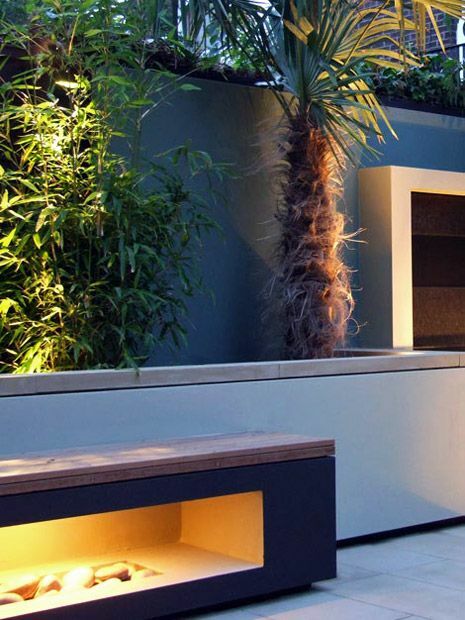 Over 4 weeks, our in-house design & build crew took top priority in constructing a pristine composition to enable the clients' enjoyment of their renewed family garden upon returning from a summer holiday. Following a substantial interior refurbishment, this home gained a spacious open-plan living room, while its north-facing garden was considerably reduced in size, where designing a functional outdoor space formed an essential element to enhance our clients' diverse family life. The grown-ups enjoy a new roof terrace outside their master bedroom, with a lush garden vista. For the kids, an artificial grass play area under trees provides an enchanting hideaway. The house frontage was reshaped into off-street parking, where further greenery softens the streetscape. 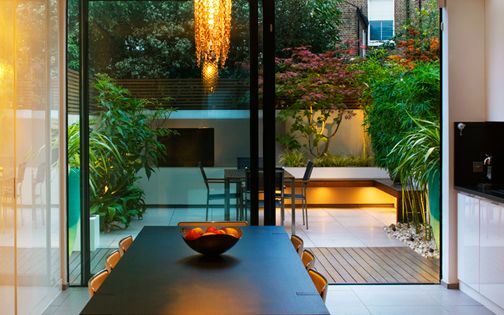 Above all, the entire residence is enveloped by the luxuriant foliage, captivating waterfall and ample seating of a North London garden designed for an active family. Our clients love water ambience, spending much time among free-flowing natural landscapes in Southern France. 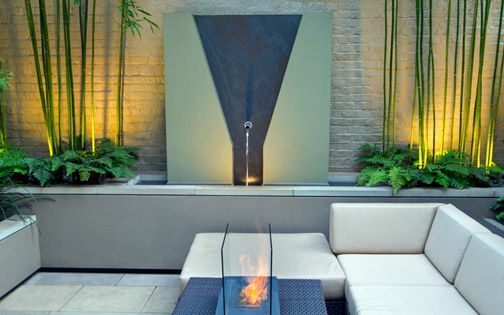 We sought to elevate the back garden's essence with soothing reflections generated by a captivating granite waterfall. 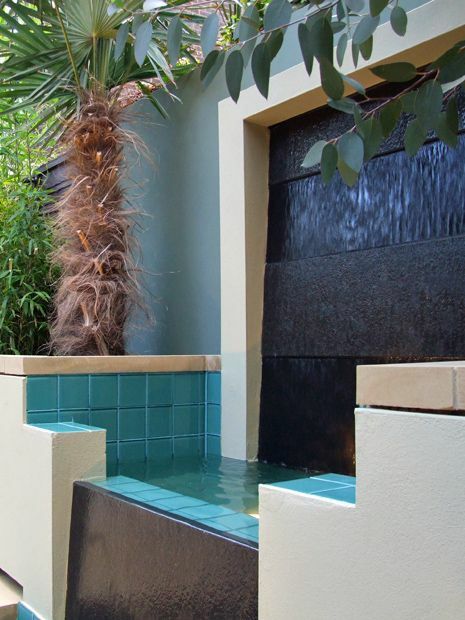 The architectural cascade is softened by evergreen foliage of Bamboo, Eucalyptus and Palm trees, forming an integral fluid connection. 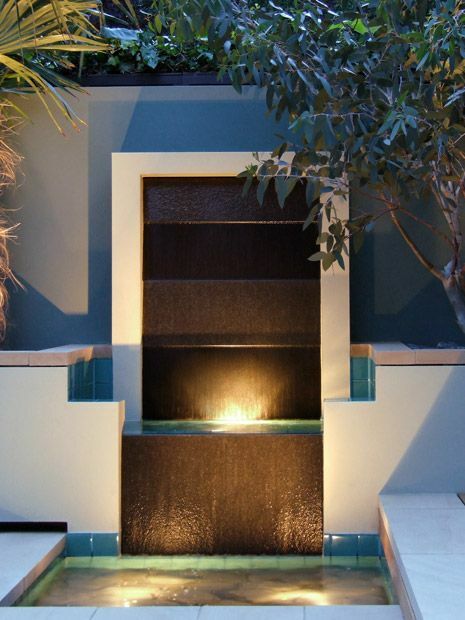 We detailed the water feature's distinctive elevation with alternating textural finishes and glass tiles across two levels, where a serene aquatic aura is enveloped by sculptural flora; its nuances gradually revealed towards the seating areas, producing energising vistas enjoyed from the rooftop terrace. 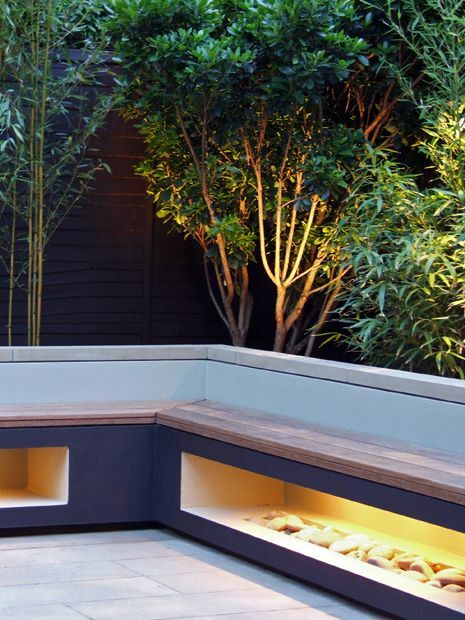 Having commenced our garden design before the culmination of this extension project, we developed the bench design while inspired by the aperture of a new fireplace, where the built-in seating structure echoes this hollow core, emitting a warm afterglow. We cantilevered concrete lintels across end columns, clad in Ipe hardwood and coated in a deep amethyst tint. 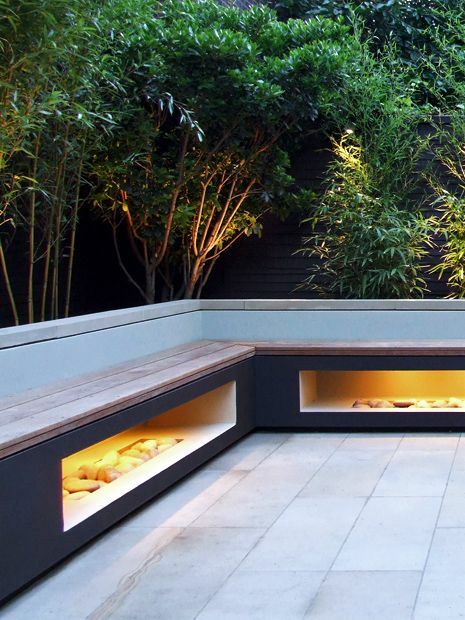 The bench layout anchors the garden design asymmetrically, producing a vibrant dynamic, floating above recessed plinths. This outline creates an opulent focal point, with spacious seating – enhancing sense of depth and indoor-outdoor fluidity. 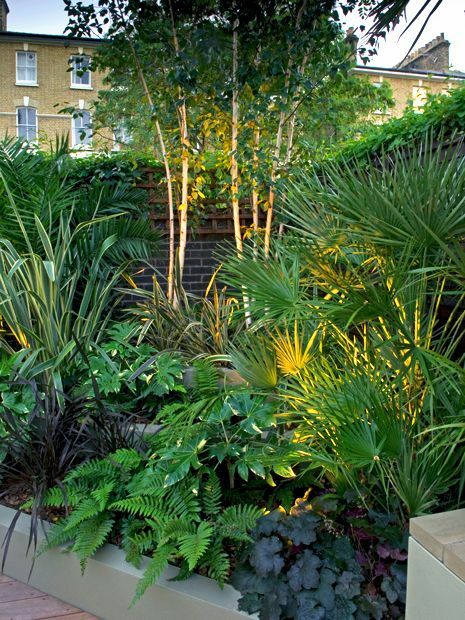 This north-facing garden is surrounded in mature treetops, where a subtle colour palette fuses a layered composition. The verdant aspect is heightened by utilising green-grey tones contrasted with deep plum purple – reiterated in bark, foliage and bloom. Glaucous Eucalyptus leafiness blends into sage-green tiles, while milky Silver birch trunks emerge above chocolatey Coral bells. 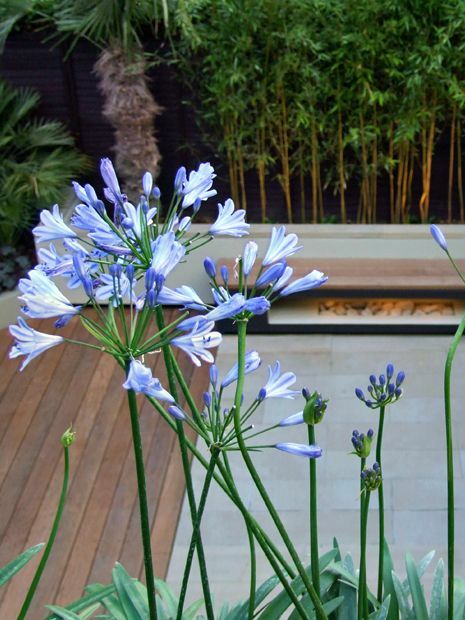 The blue petals of a miniature Agapanthus hedge which forms the roof terrace balustrade produce delicate silhouettes, hovering an effortless natural material palette. 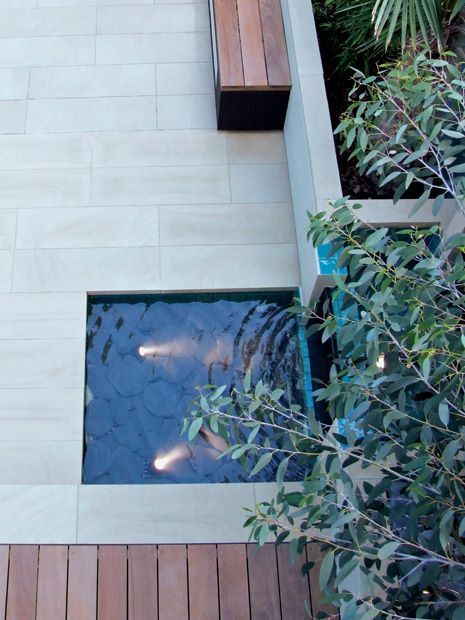 We quarried the sandstone pavers at a distinctive 90cm x 30cm size, forming a reflecting surface to increase daylight qualities; their layout balances an Ipe hardwood deck, set perpendicularly by the seating zone. 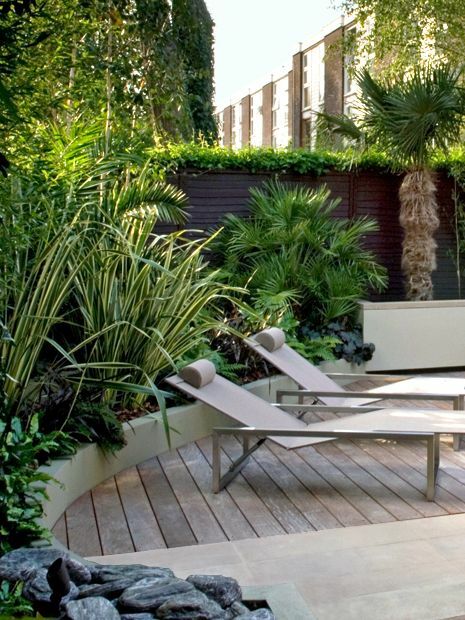 Repeating the natural wood across step fascias, benches, and the roof terrace's layout, narrates cohesive hard landscaping, where seamless juxtaposition and clear-cut detail design create vitalising shadows and light interplays. A sinuous, 3-tier raised bed along the garden's top left section contrasts an overall linear design, where scale increases progressively towards lofty neighbouring trees – merging a trio of Silver birches with Robinia and Tilia canopies. The structural planting design produced by evergreens conveys a sense of shelter – creating much-needed seclusion towards adjacent properties. As the boundaries form dense canopies atop, Palm and Fern fronds, Bamboo canes and dainty Japanese maple textures infuse tropical garden tactility, weaving a sculptural diverse understorey. A quartet of New Zealand flax cultivars generates eye-level focal points, displaying colourful variegation, while a myriad of multi-stemmed Eucalyptus, Strawberry and Palm trees portrays a Mediterranean essence – reminiscent of our clients' Southern France residence. 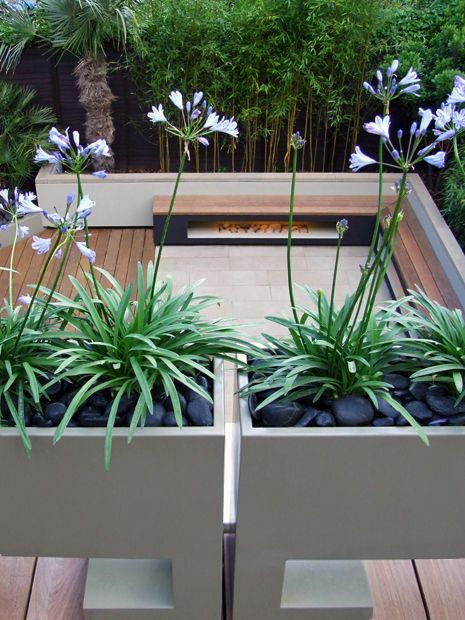 To preserve uninterrupted garden vistas from the new rooftop, we designed a trio of aperture troughs to display graceful Agapanthus. 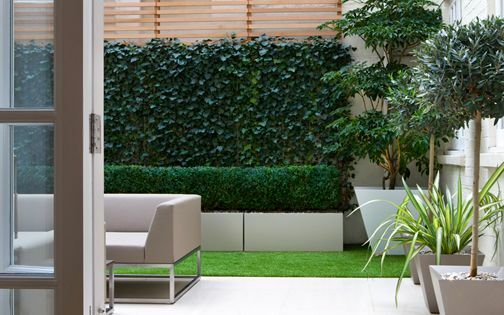 The custom-made planters form a low green wall which enables light to emanate through the cavities, while taller flora repeats textures we included in the front garden, featuring Olive trees and Pittosporums in bespoke tubs. 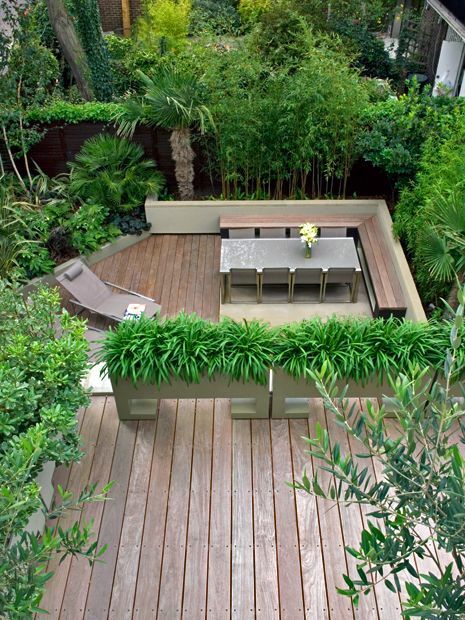 The layout immerses the garden's seating area with a verdant vista, while enhancing a connective landscape design & build scheme via its multilayered architectural perspective. 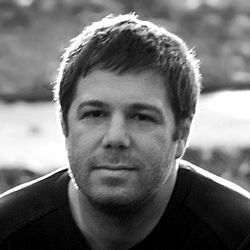 Maintaining a progressive contemporary portfolio, we developed subtle pattern variations throughout the scheme, while our clients' eye for detail steered a reciprocal design process, seeking seamless, integral character in each landscaping element. Since much daylight in this garden is filtered through established tree canopies within a north aspect, forming dappled shade, the surface nuances enhance pivotal depth and clarity. 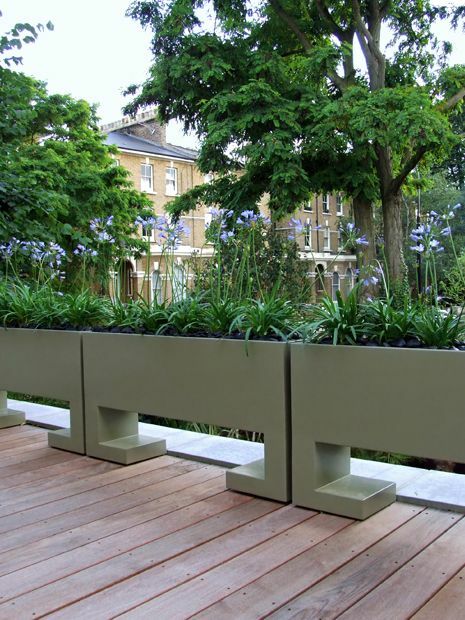 This dynamic design approach is expressed with recessed plinths along raised beds, shadow gaps under coping and cavities within bespoke planters. 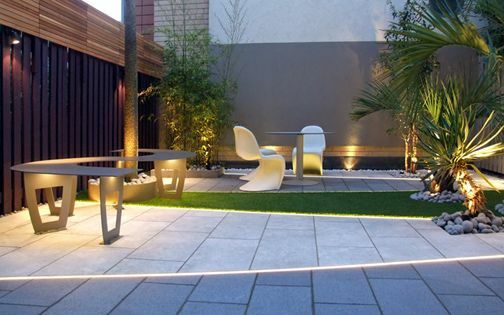 The light-toned buff sandstone, minimal grout width and 5mm board spacing in the decking design articulate a compelling garden setting with finesse and architectural unfussiness, while sustaining a vivid outdoor space all year round. The lighting scheme transforms the garden into a nightly radiant backdrop, when Golden bamboo canes emerge skywardly from deep-set raised beds to form luminescent ambience. 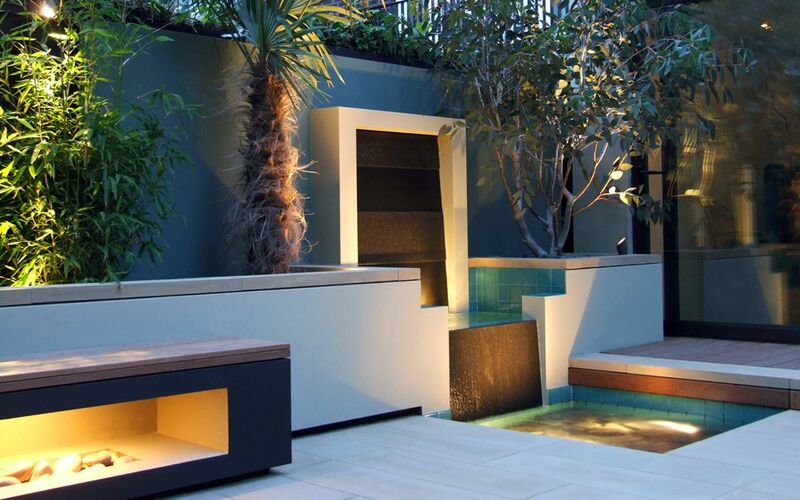 Water surfaces, bench cavities and Palm trunks project immersive reflections renewed by a multichannel keypad, as contrast between well-lit surfaces and zoned illumination produces a tranquil showpiece at dusk. 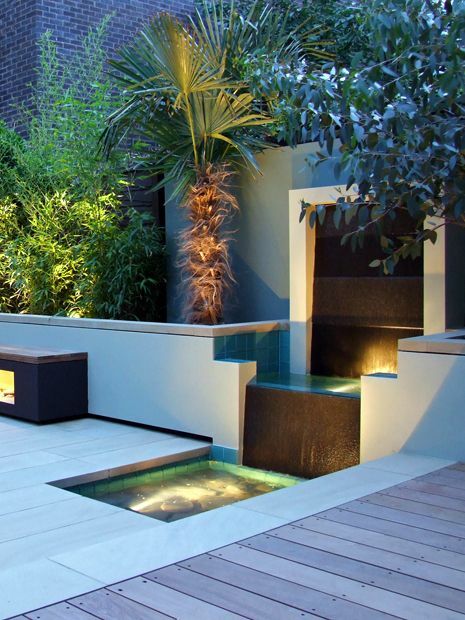 The fluid indoor-outdoor dimension is reiterated during night-time, when a balanced perspective amplifies an enticing, year-round garden design luxury. 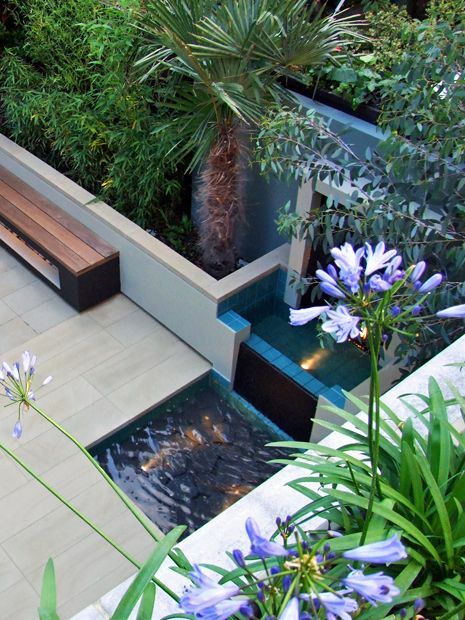 As a one-stop garden design company, we relish the prospect of creating cohesive schemes for entire residences. 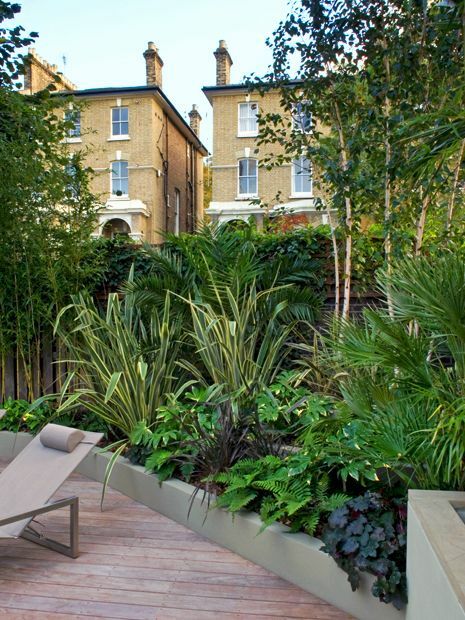 Here, in Regent's Park, we designed and built a master plan sustaining a consistent vision by developing a contemporary family garden coupled with a roof terrace – a distinctive practice which integrates our urban roof garden design skills into an original, residential exterior space. The aerial perspective formed at the top of the family home benefits not only a dynamic layout for the clients, but also our own professional insight in casting effective landscape design ideas for small spaces. 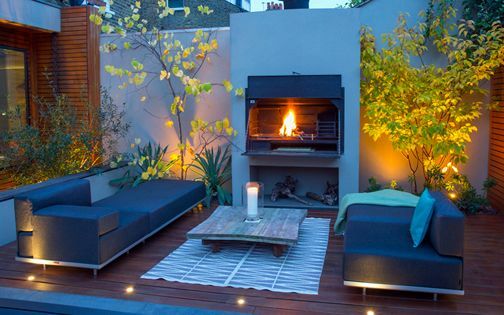 To integrate renewed verve into an extensive renovation project, while maintaining a low upkeep mindset, is to produce a cosy yet functional outdoor space. We strive to maximise every aspect of our schemes to cater for each family member, where personalised zones evolve into favourite perches to soak up sunshine, soothing water reflections and blue sky. 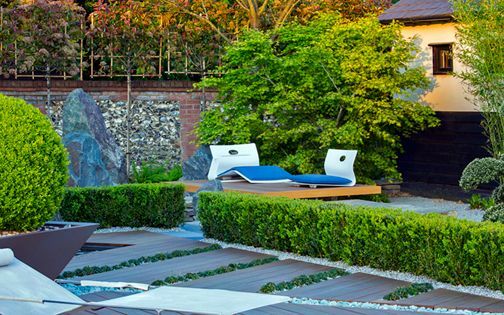 Achieving this laid-back approach, while enabling clients to effortlessly keep on top of garden maintenance, forms a central element of our contemporary bespoke gardens.